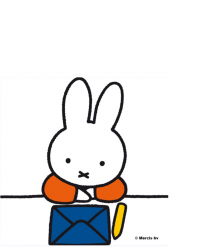 On 21st June, Miffy is celebrating her 62nd birthday! Hip, hip, hooray! Today is the launch of Miffy’s new TV show, Miffy’s Adventures: Big and Small! Miffy TV Comes to Tiny Pop! From Friday 2nd October, Miffy fans can watch Miffy’s new TV show, Miffy’s Adventures: Big and Small, on Tiny Pop at 7pm! Miffy’s recent 60th birthday celebrations in her home country of the Netherlands included a special appearance at the Down the Rabbit Hole Festival! If you’re holidaying in the Netherlands this summer, visit ’60 Years of Miffy’, on display at the Centraal Museum.